God’s actions are always determined by His will. And God’s actions are always determined by His whole nature. If we have an understanding of God’s nature, we will understand His actions. If we don’t have an understanding God’s nature, we will oscillate with instability. And faith in God fluctuates between good and bad circumstances. And trust in God ping-pongs as emotions rise and then tumble. And life has no stability because we have not fixed God’s Word in our heart. Understanding God’s Nature provides an understanding of His actions, for God’s actions are always determined by His perfect nature.. and God’s actions are always determined by His perfect will.. and God will never violate His holy character.. and God will never violate His will. If we really knew the nature of God, such yo-yo instability would cease. If we really knew the character of God we would not be tossed about by our senses. And so the question rages in the heart of men, can I know God….? Well the answer is emphatically — NO, and yet he answer is emphatically — YES. 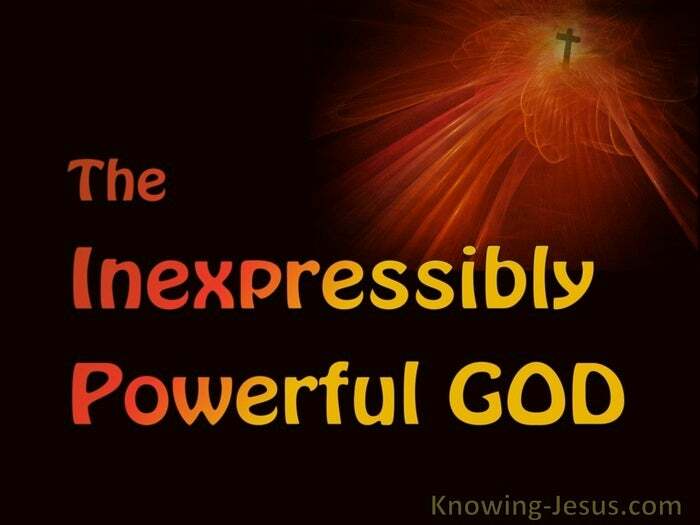 God is ‘incomprehensible’, and yet God is wonderfully ‘knowable’. God is ‘unfathomable’, and yet God chose to ‘reveal’ Himself to man. For some reason God wants to get across to man both sides of His Person. David discovers God to be unimaginably wonderful and tremendously great in Psalm 139. Job discovers His perfections reach the upmost limits of utter completeness in Job.11. Paul says He’s past finding out.. unsearchable.. incomprehensible – unknowable in Romans 11. Scripture drips with the unattainable qualities of this incomprehensible God. He is not only incomprehensible, but eternally so – infinitely past finding out. He is unknowable and His qualities are so far removed as to be unreachable. He is infinitely holy and we are finite sinners – an unbridgeable gulf. And yet this infinitely unknowable, unfathomable God chose to reveal Himself. Indeed, we are instructed to know God.. and to know Him intimately. Israel was commanded to know the God of their fathers, in 1 Chronicles 28. Asaph sings psalms of praise proclaiming: God is known in Judah. see Psalm 76. Paul knows the One in Whom he has placed his trust and faith, in 2 Timothy 1. Peter orders us to know and grow in our knowledge of Him….and in grace, in 2 Peter 3, and Jesus instructs us that to know that God is life eternal, in John 17. Yes, God chose to communicate His character to us… but how? Well, He looked at man with his pea-size brain, and his foolish notions and inflated ego, and started gradually unveiling Himself little by little. And we have that ‘progressive’ revelation of Himself in His completed word. Starting in the 1st verse of Genesis and culminating in the last verse of Revelation. He wants His creation to know Him name as Elohim: the Strong Powerful God, and then he proceeds day by day to demonstrate His power and strength. And all we have to do is to believe it, to trust Him and have faith in Him. And throughout scripture God uses this name, Elohim.. to show this characteristic. More that 2000 times this word Elohim (God) is used to demonstrate His strength. Elohim.. your Strong Powerful God, hath given rest unto your brethren, as he promised them. Josh.22:4. And the Philistines were afraid, for they said, ‘Elohim- the Strong Powerful God is come into the camp” 1Sam.4:7. Nehemiah cried: “remember me, O Elohim – my Strong Powerful God, for good” Neh.13:31. And in Job cried out: “I would seek unto Elohim – my Strong Powerful God, and unto the Strong Powerful God would I commit my cause”: Job.5:8. And in Psalm 3 verse 7 David wrote: “arise, O LORD; save me, O Elohim – my Strong Powerful God. Throughout Scripture “God” is Elohim.. the Strong One – the Powerful God, but do we really believe this? How often faith in Elohim – the Strong One – the Powerful God fluctuates.. between good and bad circumstances. How often trust in Elohim.. the Strong One – the Powerful God ping-pongs, as emotions rise and then tumble. How often life is unstable, because we have not fixed Who God is in our heart: Elohim – the Strong One – the Powerful God. Understanding God’s nature – provides an understanding of His actions, for God’s actions are always determined by His whole nature.. and God’s actions are always determined by His will.. and God will never violate His character – and God will never violate His will. Knowing God as Elohim – the Strong Powerful God is a drop in the bucket.. a tiny fragment of God’s progressive Revelation of his unfathomable nature. In Genesis 1.1 God gave the first tiny peep into Who He is.. In the beginning Elohim. 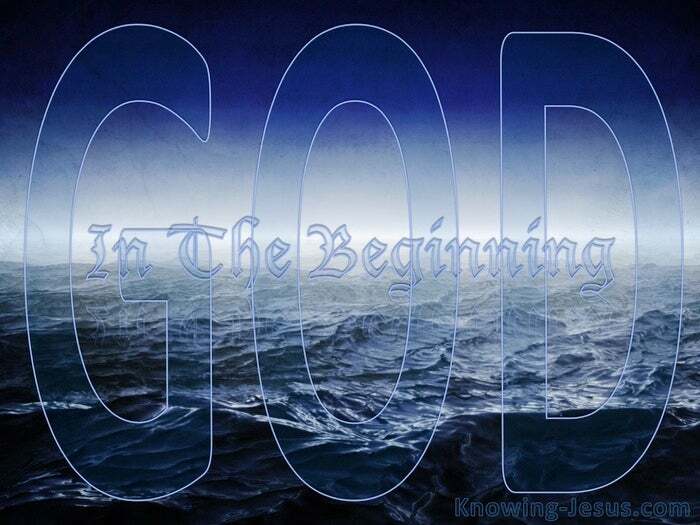 In the beginning – the strong powerful God.